Not only do facility managers have to worry about problem spots from the lack of insulation covering, but the type of insulation you use for your facility makes a huge difference as well. 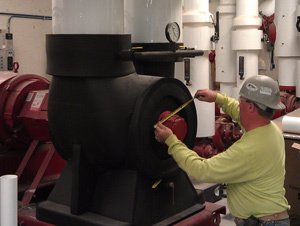 Certain types of facilities require certain types of insulation, insulation jacketing and fastening systems. We are experts in advising you what is needed to ensure your facility meets the safety and quality standards of your industry. Using a process of engineered insulation solutions along with a system of detailed energy audits, we ensure the optimum products and services to fit your needs. One of the unique aspects of insulation systems is that they are durable, low maintenance solutions. However, if insulating materials were not installed or were installed improperly for the conditions, the potential hazard to your facility and your employees is great. Our highly skilled workforce is excellent at mobilizing to meet your service demands quickly, efficiently and with as little hassle as possible. Our flexible response to your service call is aimed to help you to rapidly restore safe conditions and normal work operations.